Discussion in 'Canon InkJet Printers' started by Angelique, Nov 27, 2014. I cant seem to find any info online so i'm asking anyone if they know if an MG5150 printhead will fit into an MG5250 printer. I have an MG5250 and i've tried everything to fix the printhead but nothing seems to work. I found someone online that is giving away an MG5150 for free (paperfeed is faulty) but it's almost an hours drive to go get it....before i make the trip i'd like to know if anyone has any experience in this and if they know if the printheads are compatible?? OK you have just saved yourself a drive and you now owe me a drink at your local when I’m next in town. The MG 5250 part No. is QY6-0080-000 and the MG 5150 part No. is QY6-0073-000. Now that we got that out of the way, what exactly is the problem with your current print head, maybe we can help.. Same connector, same ink tanks, can be put inside printer, but won't go, leaving U052 or U051 error. But it is possible to repair MG5150, so you can try to get it. Some parts from MG5250 fits into MG5150. Oh, and please tell something more about error you get in MG5250. well thank u stanger!! that drink u can have at our bar when ur next in Belgium lol! The problem...the usual canon B200 error. i've tried everything i've found on the www and nada. it's a pain in the rear considering the printhead costs more than the printer! if i could just at least use my scanner i'd be a happy bunny, but nope....canon decided when one's buggered, u can sit n spin. Łukasz and The Hat like this. Meh, i've already sent the dude an email telling him it's a no sale. so if anyone can tell me which baseball bat will fix mine...i'd be eternally gratefull!....but please use lamen terms... lol....i'm a recovering blonde! Scanner functionality can be recovered with 95% probability. Black only printing with 30-50%, color printing with 10-20% depending on situation. When you take out printhead from printer, then you can see green plate with small golden plates on the printhead back - it is printhead connector. These small golden plates are called "pins" or "contacts". The simplest solution is to put small rectangles of electrical tape on certain pins on printhead connector, and then put printhead back to the printer. If it is OK to having scanner only printer it is enough. 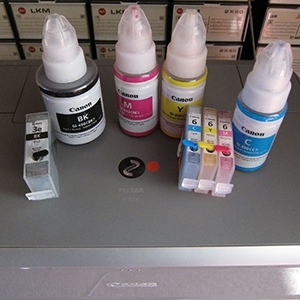 Now printer can be used with empty inks with no risk of further damages from overheating printhead. Empty inks can be enabled by disabling ink level monitor. If "error B200" perished with these seals, then printer is still capable of printing in pure Black & White with use of large black ink tank. Rest of ink tanks won't be used. Very rare situation. Pure Black & White is disabled, large black ink tank now can be empty. But all colors (including small black ink tank) are still usable. The Hat, stratman and palombian like this. ooh... i like you! I'll try that and get back to you! Thankyou! owkay...so i got my exacto knife out and puzzled out tiny wee pieces of electiecal tape. first i tried solution #3, nada. So... is it percussive maintenance time? That means badly damaged printhead (fried one of two temperature controls). Sometimes "error U052" is in pair with "error B200". B200 is higher priority, so U052 is hidden. When B200 is cleared, U052 appear instead. Error U052 can't be suppressed just with electrical tape. Strange thing is that the only way of starting the printer is by opening cover, powering up, and after printhead moves to the left, close the cover, but when I attempt to print/copy/scan....B200 error reappears. Method described above is intended to temporarily clear some errors in printer.